Scott Meldahl takes his cooking very seriously. He is a graduate of Le Cordon Bleu College of Culinary Arts in Minneapolis. He’s been master of the kitchen in some of Minnesota’s most popular restaurants. And he has his sights set on becoming a contestant on Chopped, the hit reality competition show on the Food Network. But most importantly, Meldahl is the chef at Pioneer Care in Fergus Falls, serving up meals that are made mostly from scratch, using fresh local ingredients. This might come as surprise to people who have misconceptions about the food at a senior living community. Boring and bland? Absolutely not. What made you decide to learn to be a chef? When I was 15, I had my first job and it was in a restaurant washing dishes. Eventually as I was able to learn the cooking side, I grew to take great pride in being able to make a customer’s day, even if it was for only a half-hour, by giving them a delicious meal. It was that feeling of providing a bright spot in someone’s day, that creating of a memory that drove me to grow my skills and push forward in this career choice. How did you end up at PioneerCare? Two years ago, my wife had finished her Master’s degree and we were in Duluth at the time. A job opened up over in Fergus Falls, so we decided to check out this side of the state and moved. One day I was looking for work, and there was an ad for PioneerCare, I had a 2+ hour interview and that sealed it for me, I knew there was a reason I was brought here. I bet there are a lot of misconceptions about what the food is like at a senior living community. I truly hope that the misconceptions are changing! I think many people think of hospital food when it comes to senior living. More often than not, eyes widen a bit and smiles grow a bit more when people hear about the food we provide and the lengths we go to provide a great quality product utilizing as much fresh local product as possible. It isn’t easy and we work very hard to do as much scratch food as possible, but I think that knowing and being able to tell someone exactly what is in the food that they are eating is extremely important. With all the emphasis on childhood obesity and the foods that schools are serving, I believe we should also be exploring what goes into the foods our aging community is being served when they move into senior housing. Fresh and natural is always better and should be our goal. Would you be willing to share a recipe? 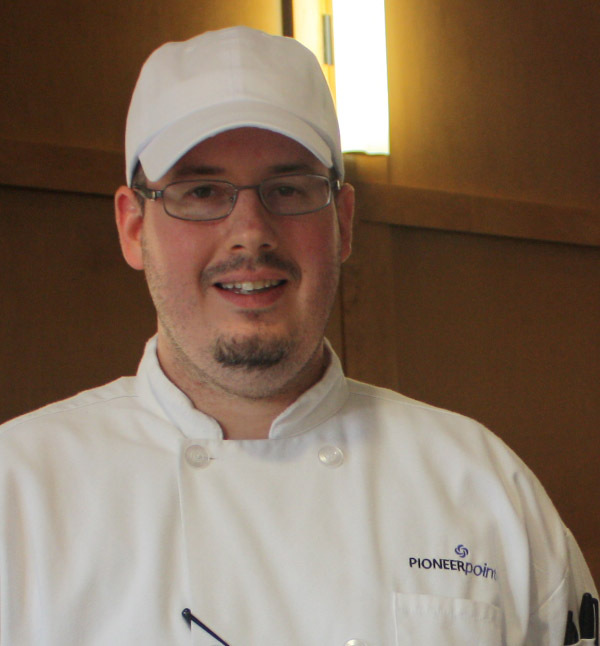 How is it different (or not different) being the chef at PioneerCare vs. at some of the other restaurants you’ve worked in? Comparing PioneerCare to restaurants is tough, because in some ways, they are so very different. We have one main choice for each meal (plus an alternate choice), so you know right away that not everyone will always be pleased, and that is sometimes difficult to deal with. You still strive for every meal to make your customer base happy no matter where you work, but they are living here, so you are cooking basically in the people’s home. I think that brings an added pressure that isn’t there when people are coming to your establishment to eat. It feels at times that roles are almost reversed. It is a thrilling experience, one that I wouldn’t change. 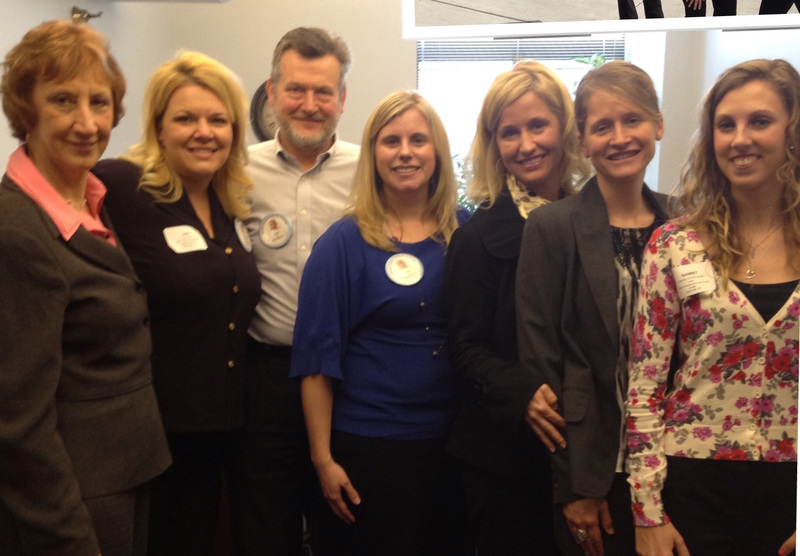 Thank you, Scott, for taking time to share your story with Aging Services – and for all you do serve older adults! May 6-12 is National Nurses Week – a time to recognize the extraordinary people who choose a career path of service and support. There is something extra special about the nurses who serve older adults and their families. As a part of the Aging Services of Minnesota Stars Among Us campaign, we asked caregivers to tell us why they chose a career serving older adults. We received hundreds of responses, but here are just a few that represent the heart and soul of this profession. We are so thankful for all you do on behalf of older adults and families in Minnesota! Older adults are beautiful inside and out. I am inspired by their strength, endurance, trust and their life stories. I have been encouraged and motivated by many over the years, including previous directors and co-workers who believed in my skills when I didn’t. I have had challenges, as many have, and I am able to keep going on tough days by using humor along with my faith. 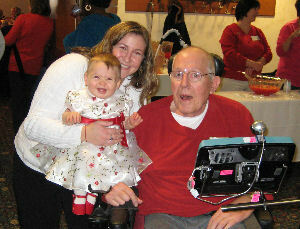 My husband and grandchildren are also an inspiration. What does a career serving older adults mean to you? What is the most meaningful or rewarding part of your job? The most challenging? My career serving older adults has truly been a blessing. My life is richer because of those I have cared for over the past 30 years. Taking care of older adults is my passion. The most meaningful and rewarding part of my job is being part of a very large family. Older adults desire to learn, and hosting “Coffee with the Nurse” monthly provides education and empowering the residents with knowledge is a joy. I advocate for attentive medical care for aging adults. In the past few months I have experienced negative outcomes when sending residents that are ill to Urgent Care or the Emergency Room. Public Policy makers need to realize older adults can make decisions for themselves. 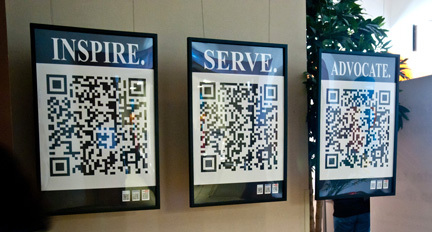 The work we do is not work, it is all about serving one another as we age. This is one of the most rewarding occupations. That the work I do improves their quality of life. My Director of Nursing motivates and inspires me by advocating for me and supporting my decisions. It is the little things that keep me going on tough days, the smile or joke from a resident. A career serving older adults means: Promoting self care and independence to the client’s highest ability, assuring safety/ comfort and cleanliness, maintaining dignity, and maintaining stability. The most meaningful part of my job is not just knowing, but seeing, that my work makes a difference in people’s lives. Most challenging is underfunding for seniors. I advocate for health care coverage for everyone. Compassion for the elderly and understanding that they have lived a life full of experiences. Now that they may need further assistance with daily living, I am honored to create a comfortable and safe living environment. What keeps me going on tough days is the residents and their families – understanding that challenges are opportunities blossoming into the environment that we strive to create. The most rewarding part of my job is seeing the employees, families, and residents with a smile on their face. The most challenging aspect of my career is going home at the end of the day. I always feel like there is more to accomplish in creating a better life for the residents……it’s hard to leave even though I am completely exhausted. I advocate for the residents, families, and my co-workers. I feel that everyone has a voice and it is needs to be heard; everyone has a different thought process and different views and ideas. If I can share their knowledge with others and it benefits something, it is worth it. I have always had several elderly people in my life, usually family members. The one thing that always impressed me was their spirit of sacrifice-they were willing to do whatever it took to make sure their families were cared for and society progressed. It means carrying on that spirit so that what they accomplished is not lost. If I can build on what they started I can care for my family and progress society. How hard we work-physically and mentally. I am I am always amazed at my co-workers, how they can always give whatever it takes to get the job done. They truly love their residents and treat them with respect, love and generosity. Thank you to all nurse caregivers who make a difference every day in the lives of the people you serve. 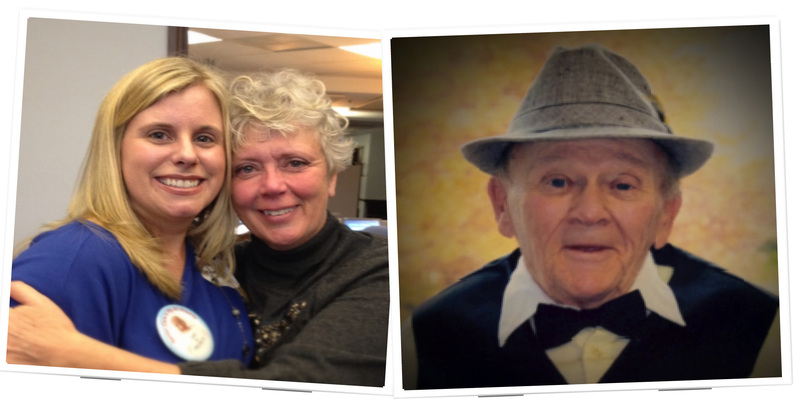 Click here to read more about the caregivers who truly are Stars Among Us here in Minnesota. Minnesotans & Long-Term Care: Where do we stand? A few weeks ago, we released the results of a statewide public opinion poll commissioned by the Long-Term Care Imperative. The results were both fascinating and worrisome. 1. Minnesotans are not prepared to pay for their care. 2. Access to quality senior care is a right, not a privilege. 3. Caregivers (formal and informal/family) need more support and resources. What do you think when you see these numbers? We know Minnesotans want to remain independent for as long as possible as they age, but we also know most won’t be able to pay for the care they need and want. 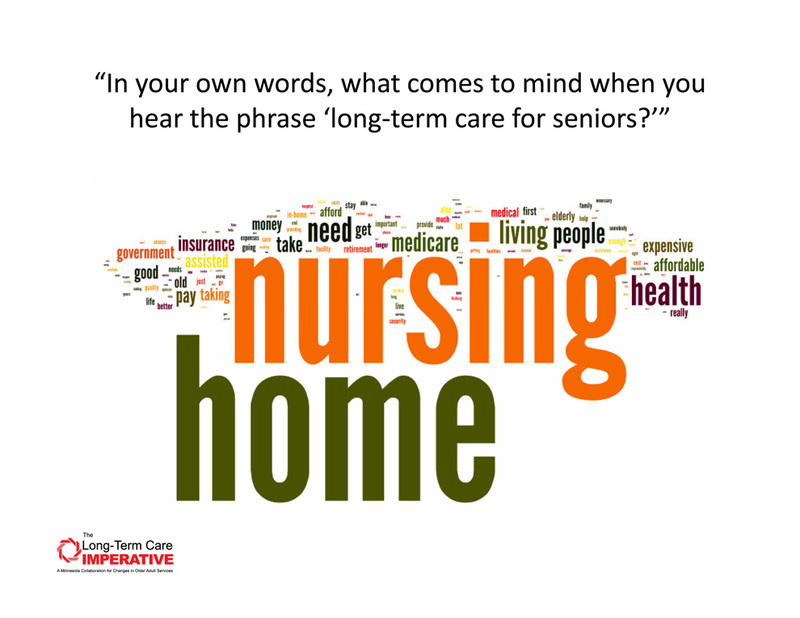 We’ll continue to post excerpts and additional findings from the Long-Term Care Imperative poll in the coming weeks – stay tuned. Congratulations to Lisa Kalla, administrator at Johanna Shores – a Presbyterian Homes & Services community in Arden Hills. Lisa was one of nearly 150 amazing caregivers who submitted their stories to the Stars Among Us campaign during the 2012 Aging Services of Minnesota Institute. She is also the lucky winner of an iPad2! What inspires me to serve older adults is truly the mutual satisfaction of helping someone. It sounds like a cliche but when you hold the hand of the dementia resident who is scared and see their fear dissolve, you really see you are more than anything a mission statement can describe, you are everything to that person. Sometimes when we focus on the regulations and reimbursement, it is easy to get discouraged but then you think about how important you are to that one person you may have touched today and it inspires you to go on, to try to change systems, to get back to the reason you entered into this job and be with the residents and realize you being there is what matters most to them…that is what inspires me. What does a career in older adult services mean to you? A career serving older adults to me is a career of change. You change with resident acuity, you change with business needs, you change with the uniqueness each resident brings. I love working for a Christian organization that focuses on the residents needs and individual differences. The most rewarding part of my job is figuring out how to balance excellent care, budget and resident individuality. Learning about resident likes, wants and hobbies and then implementing programs to really enrich the lives of the residents we serve. The most challenging is to see the residents we grow to love decline physically and mentally. Take a few minutes to read the inspiring stories of caregivers who have dedicated their lives and careers to serving Minnesota’s seniors. These people are changing lives every day and we are so grateful they’ve chosen to share their talent and passion in the field of older adult services. We are still collecting Stars Among Us stories and displaying them in our online gallery – will you add yours to the collection? Aging Services will share these stories with lawmakers, community leaders and other organizations who are working together to support senior care in Minnesota. Why do you serve older adults? We all know them – people who go above and beyond. They don’t just do their jobs, they seem to really like their jobs. They go out of their way to make someone else’s day better. In the field of older adult services, these are not the faces and stories that make the front page of the newspaper – but they should. So here at Aging Services, we’re trying something new. We created the Stars Among Us campaign to shine a light on the people who are the backbone of our support system for seniors. We want to celebrate the difference you make in the lives of those you serve and the contributions you make in your community. If you work in the field of aging in Minnesota – whether you’re a nursing assistant, dietary specialist, housing manager, marketing specialist, administrator, director of nursing, housekeeping specialist – you are a Star Among Us. The Stars Among Us campaign is for anyone and everyone who has dedicated their career to serving older adults. You do not need to work for an Aging Services of Minnesota member, you just need to proudly serve Minnesota seniors. For a little added fun, all Stars Among Us entries received by February 10th will be eligible to win a FREE iPad2. Tell us your story today – and please spread the word. The Stars Among Us deserve to be in the spotlight, don’t you agree?